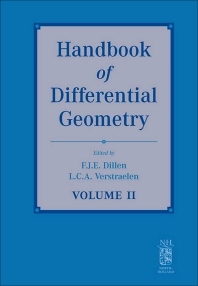 In the series of volumes which together will constitute the "Handbook of Differential Geometry" we try to give a rather complete survey of the field of differential geometry. The different chapters will both deal with the basic material of differential geometry and with research results (old and recent). Some problems on Finsler Geometry (J.C. Alvarez Paiva). Foliations (R. Barre, A. El Kacimi). Simplectic Geometry (A. Cannas da Silva). Metric Riemannian Geometry (K. Fukaya). Complex Diferential Geometry (I. Mihai). Compendium on the Geometry of Lagrange Spaces (R. Miron). Certain Actual Topics on Modern Lorentzian Geometry (F.J. Palomo, A. Romero).